©2017, Joan Desmond, Red Tree. Recently there was a winter storm and white completely redefined the landscape. I walk out to new visual discoveries. 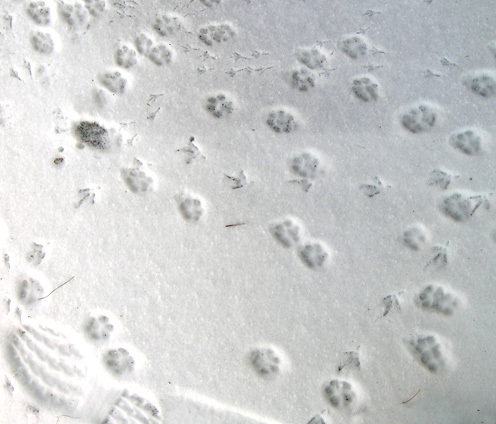 Parallel lines of forked quail prints cross the oval tracks of a lone rabbit. Snow sits fat, frosting dollops on green sugar bush branches and pine needles. Feathered crystal patterns reflect from a puddle. 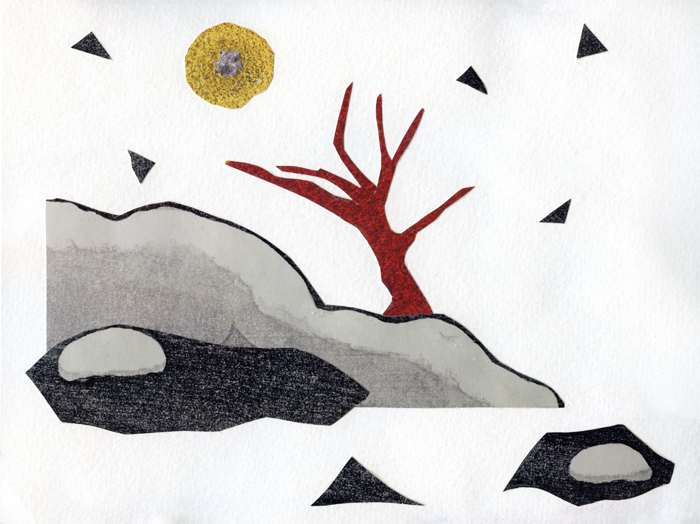 Mostly I am breath-caught silent by the space around objects, the negative space. It is that tree, that boulder, that view that is now silhouetted and distinct within the whiteness, each is highlighted and suspended for a moment, a day perhaps. This December we are missing the sharp, frosty intensity of a California mountain winter. There were gray moody skies last week, but promised heavy rain pathetically sputtered and spit. I’m still watering plants, filling birdbaths, and turning sprinklers on a small patch of lawn, hopping around jackrabbit droppings from three that still visit every morning. Boots and sweaters are hiding in the closet from all of this bright sun. There is a particular quality to such winter light, cool air yet clear, putting a keen edge on objects, casting color a little deeper. I’ve spent more time observing, recording in drawings, looking, looking; there was even an urge for clean windows when looking out from the living room. Then sinking stomach regrets with the first thump of a bird attempting a fly through, panicked whirring of wings, then another thud. Investigating outside I found two dying quail, a male and female, on the front deck and the resident Coopers hawk gazing down from the gray pine. Wait, this is a repeat scene. Has the hawk figured out? … He frequently strafes the driveway low, toward the house, rousting gathered birds. Now the dilemma, how to retrieve kill next to that reflecting glass door? It waits, watches, the birds cool. I wait inside, conflicted, don’t interfere… but it would be such a waste … more wait, but eventually limp feathered bodies lie at the end of the driveway. The hawk held its position 20’ above as I walked out. Then more waiting behind the shiny window while watching that thin, twisting, angling neck up there. Two ravens fly in and are attentive. Come on hawk, poster child for excellent eyesight, the deck is empty now. Minutes, many minutes go by. In an unusual departure from my more abstract images, there’s now a raptor painting in progress in the studio; but then it’s an unusual month. Oh, and the windows are dirtying up again. 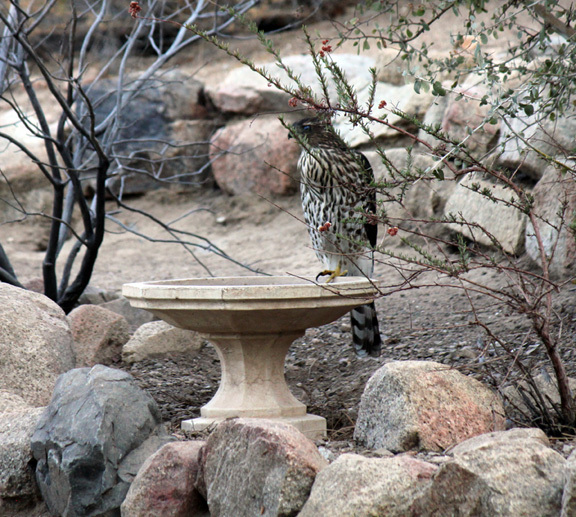 ©2012, Joan Desmond, Coopers Hawk. 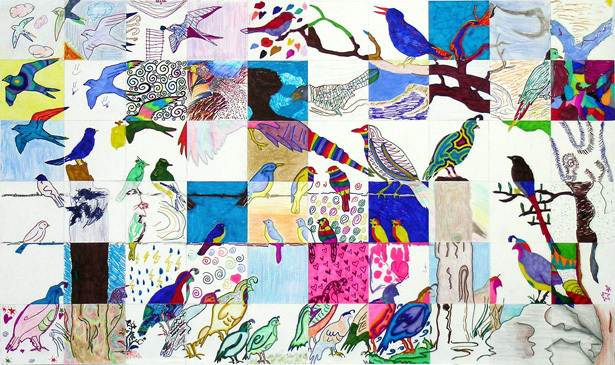 More than fifty people participated, ages three to eighty seven, to create this feathered 5′ x 36 ” image at the South Fork School Arts Festival. A great mix of individual style. We’ve got color! This mural and the one from last year remain at the school.